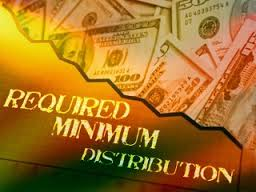 For most people, 70½ is when you need to begin taking a required minimum distribution ("RMD") from a retirement account. Specifically, if you have IRAs, the first RMD must be taken by April 1st of the year following the year in which you reach 70½. If you wait to take your first RMD until the year following the year in which you turn 70½, you'll have to take a second distribution in that year by December 31st. After that, RMDs must be taken each following year by December 31st. Note, Roth IRAs are not subject to the RMD rules during the life of the Roth IRA owner. If you are 70½ or older and required to take an IRA minimum distribution, note that the amount can be taken from a single IRA or any combination of IRAs. This amount is determined by dividing your total IRA balances (don't include Roths) on December 31st of the preceding year by your life expectancy factor (see IRS Publication 590). And, if you fail to take the minimum amount, you could face a stiff 50% excise tax on the amount not distributed as required. Of course, at this age, you are always allowed to take more than the minimum from your IRAs. A lot of people ask us when they should take their RMD – at the beginning of the year in January or at the end of the year in December. Like the answer to most questions, it depends. Obviously, if you need the distribution to cover expenses then you should take it, when you need it. If you can wait until December, then you get the benefit of the funds growing tax-deferred for practically another year. Some clients will take their RMD in equal monthly payments over the entire year, similar to a pension or social security check.